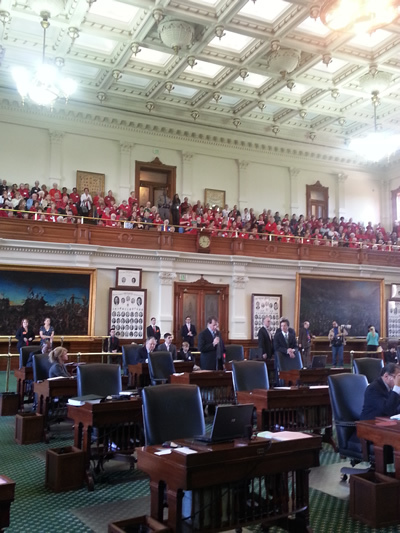 Over 1,100 TRTA members rallied at the Texas Capitol today. 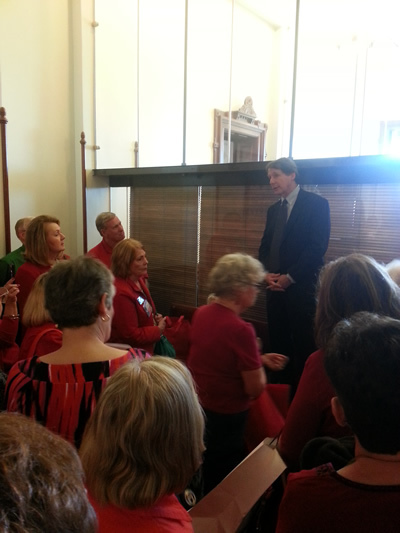 Championing a strong legislative agenda, our members were both seen and heard. Thousands of phone calls and emails compliment Capitol efforts. Complete update and recap tomorrow. Thank you everyone who made the trip and participated in email and phone advocacy efforts! Tomorrow is our Texas Retired Teachers Association (TRTA) Day at the Capitol event! We are expecting nearly 1000 retired teachers and school personnel to arrive in Austin early tomorrow morning by buses and carloads! We are glad that so many of our members are able to share in the excitement of TRTA’s grassroots lobbying efforts. Many of you want to participate but were unable to come to Austin today. We still want and need your help. Your voice can be heard today! We need as many TRTA members as possible to contact their legislators first thing Wednesday morning! You can do this by telephone or email, or both! Have you signed on to co-sponsor HB 1383 (TRS funding bill)? Have you signed on to co-sponsor HB 103 (TRS supplemental payment option)? Will you be able to do this today or later this week? Do you have questions or concerns about HB 1383 that we can answer for you? What other specific plan do you have that will improve TRS? Please let TRTA know if we need to follow-up with your Representative and answer additional questions. What is the Senate’s plan for getting TRS actuarially sound? How can we help push real solutions for an actuarially sound retirement fund? What plan do you have to help get us to actuarial soundness? Are you a co-sponsor for SB 643 (TRS supplemental payment option)? Will you consider signing on to this bill? Use the TRTA Legislator Hotline to call your Senators and Representatives: 1.888.674.3788. Click here to send an email to your legislators (http://www.votervoice.net/groups/trta/advocacy/?issueid=31354)! Please click here (www.trtaportal.org/PDFS/FactSheet2013DAC.pdf) if you want to download the TRTA Day at the Capitol Fact Page. In addition to the Fact Page, TRTA has created a new flyer entitled “This is Our Story.” On the reverse side of the flyer, our members may include details about their own education careers and lives, and send the flyer to their legislators. This flyer is a great way to put a face to the issues affecting hundreds of thousands of TRS annuitants. The flyer can be found on our website here: www.trtaportal.org/PDFS/ThisismyStory.pdf. A recap of the TRTA Day at the Capitol will be posted to the Inside Line tomorrow. Our members can also download a press release from the TRTA website and edit it to include local details. We encourage all Day at the Capitol attendees to send the release to their local news outlets. The press release may be downloaded at the following link: www.trtaportal.org/PDFS/Press%20release%20for%20local%20units%202013.doc. 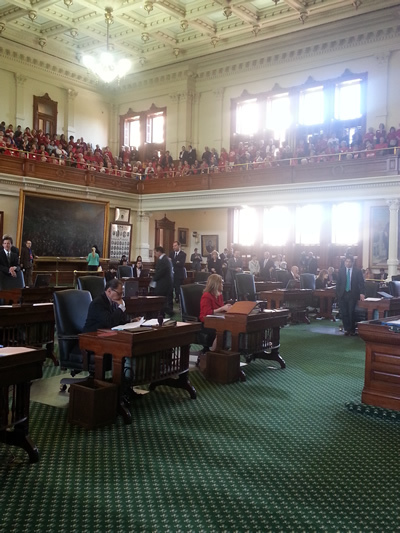 Thank you again to everyone participating in the TRTA Day at the Capitol. We appreciate you coming to Austin, or participating through the email advocacy campaign or phone calls!! We need everyone to participate, even if you cannot be in Austin, your emails and phone calls will absolutely be heard and felt during the event. Your membership is what makes TRTA the successful organization that it is! The Texas Retired Teachers Association (TRTA) is championing a bill that calls on the Legislature to increase funding for the Teacher Retirement System of Texas (TRS). The bill, HB 1383, is authored by State Representatives Jim Keffer and Bill Callegari. At yesterday’s House Pensions Committee hearing, Representative Keffer had the opportunity to present his bill. Saying that the Pensions Committee was not the place that funding levels would be decided, Representative Keffer called for the committee members’ favorable support of the legislation so that the message that “more is needed and expected” for TRS would be carried to the House floor. Representative Keffer also made it clear that adequately funding our pension funds today ensures their long-term solvency at a lower cost to the state and the member and is the best, most conservative solution. There was strong support from members of the Pensions Committee. All voiced support for making the pension trust fund actuarially sound. Some members, however, made the point that increasing state funding for TRS does not give retirees a raise in their annuities. Tim Lee, Executive Director of TRTA, responded to this sentiment by saying that “doing nothing is not the solution.” Mr. Lee testified that more funding is the best path to solvency, and the quickest path to getting an increase for retirees. HB 1383 does not incorporate a cost-of-living increase; it is a funding bill that reverses the trend of inconsistent state contributions to the pension fund. The bill is a major component in creating better financial footing for TRS, which must be addressed to protect the fund’s long-term solvency. With this stabilized funding, TRS will be able to manage its liabilities with greater certainty and incorporate benefit increases as needed. Clearly, since annuities have not increased in 12 years, the need is great. Tim Lee challenged each Pensions Committee member to pass this legislation and stand with Representative Keffer as he pushes for more funding to get the pension fund on sound actuarial ground. As is common when a bill has its first hearing in a legislative committee, the measure was not voted on last night. It is subject to committee action later in the session. If you do not see your legislator’s name on the list of co-sponsors, ask them to support this important bill. TRTA’s Day at the Capitol is tomorrow. Let’s see how many new co-sponsors we can gain during our rally day! Call the legislator hotline at 1.888.674.3788 to get in touch with your Representatives! More is necessary, and perhaps even possible, but we need to begin somewhere. This legislation is a major step in the right direction. TRTA will keep you updated on HB 1383. TRTA wants to say a special “Thank You” to the members of the Austin Retired Teachers Association, members from the Williamson and Milam Counties Retired Teachers Association, and other members from TRTA District 6 and 13 who attended the Pensions Committee last night. Many offered valuable public testimony including TRTA members Tom Rogers and Jamie Larson. Thank you TRTA members for being visible and vocal on behalf of your fellow TRTA members!! Thank you for communicating with your legislators about this bill. If you are not a member and want to join in our important work, please contact our office at 1.800.880.1650. Thank you!